Located in the northeast of Australia, Queensland boasts a rich history, efficient cities, picturesque coastline, and lush interior rainforest. Tourism in Queensland tends to revolve around the Sunshine State's countless beaches and coastal enclaves, which engender a laid-back, easygoing way of life. Named after Queen Victoria, the state was first settled by Europeans in the 17th century, but the area is believed to have served as home to the country's Aboriginal population as far back as 60,000 years. Brisbane: The state capital and largest city, Brisbane serves as the base for many Queensland holidays, charming visitors with its warm weather, pleasant park spaces, and modern architecture. Cairns: An important regional outpost and gateway to Far North Queensland tourism, the compact city of Cairns bustles with energy from visitors on their way to the Great Barrier Reef or the rainforests farther north. Surfers Paradise: As its name suggests, this beachfront suburb offers some of Australia's best conditions for riding large, curling waves, with plenty of high-rise hotels and a rampant party scene catering to tourists. Port Douglas: Set among some of Australia's most verdant natural scenery, laid-back Port Douglas sits in close proximity to some of the best places to visit in Queensland, including the Daintree Rainforest and the Great Barrier Reef. South Bank Parklands: Nestled on the southern bank of the Brisbane River, this network of green spaces houses some of the city's most popular tourist attractions, and also serves as a great spot to relax with a picnic. Lone Pine Koala Sanctuary: Cuddly koalas steal the show at this conservation park, which also houses plenty of other Australian wildlife, including kangaroos, platypuses, and rainbow lorikeets. Warner Bros. Movie World: Take a thrilling ride on a roller-coaster themed around one of your favorite movies at this Gold Coast amusement park, with rides inspired by "Superman," "The Justice League," and "Looney Tunes," among others. Surfer's Paradise Beach: Add this beach to your Queensland itinerary and mingle with one of the country's hippest surfie crowds, or grab a board and have a go at conquering the large waves yourself. Australia Zoo: Founded by the parents of the late Steve Irwin--Australia's famous Crocodile Hunter--this extensive wildlife sanctuary houses an array of exotic and native animals, including kangaroos, koalas, and, of course, some fierce crocs. CityCat Ferry: Hop aboard this sleek, modern boat to gain a different perspective on Brisbane and its surroundings, complete with an interesting guided tour of the area. Esplanade Lagoon Pool: The heat and humidity on a Queensland vacation can be stifling--cool off by jumping into this saltwater pool, which offers pleasant views over the beach and the water beyond. 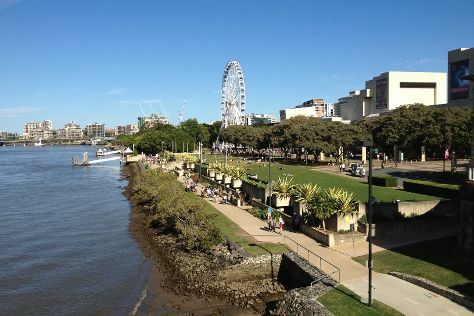 The Brisbane River: Once serving as the lifeblood of the city, this snaking river is now lined with high-rise buildings, park spaces, and well-maintained paths perfect for a long, pleasant stroll. Esplanade Boardwalk: You can spend hours meandering along this relaxing seaside promenade, which connects the heart of the city with some of the natural delights dispersed through it. As you plan your family vacation to Queensland--one of Australia's most popular tourist regions--you'll be amazed at how many kid-friendly places the state has to offer. Begin in Surfers Paradise, where the kids will have days' worth of frantic fun at Australia's biggest theme parks. Head up to Brisbane for visits to zoos and wildlife centers, then add some natural wonder to your Queensland itinerary with a trip farther north to Cairns. From there, embark on an experience your family will never forget: snorkeling the Great Barrier Reef. Perhaps more than any other region in Australia, Queensland tourism offers something for children of all ages and interests. The major theme parks in Surfers Paradise, including Warner Bros. Movie World, offer an array of themed rides, attractions, and live shows to keep them enthralled for days on end. Of course, active kids can also burn off some energy while cooling down at the state's countless pristine beaches--such as Surfer's Paradise Beach--along the extensive coastline. Another staple of family vacations in Queensland is Australia Zoo, where little ones can see some of the country's most impressive animals in the flesh. Finally, don't miss the opportunity to take the kids to the Great Barrier Reef, with a snorkeling tour to underwater wonderlands like the Opal Reef. As with other parts of the country, a Queensland holiday comes with some natural risks that your kids might not be aware of, but that you can easily help them avoid. Make sure you get your kids to apply plenty of sunscreen to protect against Australia's particularly harmful UV rays, and bring plenty of bug repellent to ward off the tropical insects. You should also keep a close eye on the little ones when in the water, as the ocean currents can be unpredictable. If visiting popular Queensland tourism destinations, such as Surfers Paradise or Port Douglas, you'll find a wide range of tours and accommodations that cater specifically to families. Thanks to the state's lengthy coastline and favorable climate, you'll have an abundance of seafood options during your trip to Queensland. First and foremost is the Moreton Bay bug, a delicious variety of lobster found near Brisbane, often served cold with mayonnaise or as part of a pasta or salad. Other seafood, such as prawns, mud crabs, and the white-fleshed barramundi fish appear on menus across the region. Make sure you try some freshly grown tropical fruits during your Queensland vacation; the state's bananas, mangoes, pawpaws, and avocadoes have a reputation as among the finest in the world. You'll find the widest range of shopping options in Queensland's biggest and most tourist-focused cities. Visit Brisbane to browse independent shops selling handmade souvenirs and precious Australian opals. If you head to Surfers Paradise, you'll find a great selection of independent and international clothing brands, with women’s fashion and beachwear particularly popular in the coastal hot spot. Keep an eye out for souvenir shops and art galleries in the more popular places to visit in Queensland; you’ll have the chance to buy some locally made Aboriginal art, including ornately painted didgeridoos and boomerangs. ●	Despite only having a population of around 4 million, Queensland covers an area more than twice the size of Texas. ●	On average, the state enjoys nearly nine hours of bright sunshine every day. ●	One of Australia's two main political parties, the Labor Party, was founded in Queensland back in 1891. ●	The state places a strong emphasis on protecting its nature, with over 200 national parks--some of the top attractions in Queensland. True to its name, Queensland celebrates the Queen's Birthday, a public holiday on the first Monday in October--the only Australian state to recognize the holiday on this date. If your trip to Queensland falls in August, you may catch another of the state's unique festivals: the Royal Queensland Show, also known as "Ekka," at the showgrounds in Brisbane. Here you'll enjoy live music, art displays, and activities relating to the state's proud agricultural heritage. The year-round warm weather means you can catch a number of music festivals no matter when you plan your Queensland vacation. As the closest Australian state to the equator, Queensland on the whole experiences a hot and largely humid climate. Southern and more elevated parts of the state have colder winters; meanwhile, northern cities like Cairns endure hot, humid summers with average temperatures over 30 C (86 F), but enjoy warm winters that rarely dip below 15 C (59 F). Farther inland, places like Mount Isa experience a much drier, desert-like climate, with the mercury sometimes pushing 45 C (113 C) in the height of summer. April and May are widely considered the most pleasant months for a tour of Queensland, although you're likely to experience decent weather no matter when you go. Despite the long distances across its massive area, Queensland runs a relatively efficient public transport system. Within Brisbane, you can get around using the city's comprehensive bus and ferry network. If traveling to more isolated cities like Cairns, look for inexpensive airfares to save yourself a long bus journey. Alternatively, you can rent a car and use the state's well-maintained network of highways to get around on your own steam. Use caution if driving inland into remote areas during your Queensland holiday; you'll need to bring extra fuel and plenty of food and water with you, as you might find yourself several hours from the nearest service station.